It’s March, but that does not mean it is too early to start gearing up for the Fargo nationals. Why? Because if you are still in high school, as soon as your season ends there will be the better part of a couple hundred wrestlers in your bracket already training. This is an especially tricky topic for Cadets and Juniors still in high school simply because there are always those “x-factor” kids, the wrestlers who struggle a little bit during folkstyle season but seem to adapt well to freestyle and/or Greco. Fargo is full of sleepers – wrestlers you might not have heard about or are impressed with, but the next thing you know, they’re standing across from you later in the tournament. Since you can’t prepare for just one type of opponent, it becomes all the more important to train for anyone you might face. As soon as folkstyle ends, it is certainly permissible to take a breather for a week or two in order to “come down” from however your season went. This is actually recommended to avoid burning out. Had a disappointing finish in the states or regions? Do an objective overview of what went wrong and apply that desire to fix it by seeing the Fargo nationals as another goal to reach. If the opposite is true and your folkstyle season ended on a high note, then try to realize that doing well at Fargo can be a catalyst to continuing that momentum. No matter how you slice it, it isn’t too hard to find the motivation necessary to keep training. But be sure to concentrate on the word “motivation”, because that is what separates the pack when going to all those early summer practices becomes rough. 1. Is Your Club the Place to Be? This might be a touchy topic, but it is one that requires attention. Just because your wrestling club is great for folkstyle does not mean it is set up well for the summer season. Depending on the circumstances, this can be due to any variety of factors, so try to answer these questions to determine if you are training where you should be. Are your club coaches experienced in Greco and freestyle? Do you have good training partners? Are there scrimmages and combined practices? Are you getting enough technique drilling? No one likes to cause drama by leaving a wrestling club to go somewhere else for a few months. There are relationships with coaches and other wrestlers that can make this a very difficult decision. THAT DOESN’T MATTER. If you are trying to achieve a national title and your current wrestling club does not offer the resources necessary to help make that happen, finding a more suitable training center isn’t just an option, it’s a responsibility. If your current club coaches are as great as you think they are but come up short when it comes to the international styles, then they will completely understand your desire to prepare for the Fargo nationals someplace else. How and where you train for a national championship, specifically at the youth levels, makes all the difference. Talk it over with your coaches and parents to determine if where you are is a good fit for reaching your goal. More and more age group wrestlers compete all year long. But there is a difference between going to some “off-season” practices or entering a couple of local summer tournaments and getting ready for Fargo. It’s an apples and oranges kind of thing. One of the toughest things to do as a Cadet is turning off distractions. This is true for any high school wrestler, but it is even more of a challenge when the weather begins to warm up. Friends are off having fun going to the beach, hiking, or jumping in pools. Meanwhile, you’re at practice training for a huge opportunity. 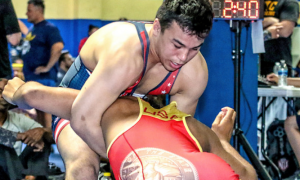 US wrestlers may be used to shutting out distractions during folkstyle season, but it’s a little bit different once the summer starts to heat up. Remember – no one is going to put in the work for you. If Fargo is anything, it is a separating point between those who are dedicated and those who are just happy to be there. It’s fine to be “happy you made it”; it’s also fine to do whatever you can to win the thing. There is no rule that says you can’t hang out with your friends a little more or go on a couple of adventures. The key is finding a balance between practicing and enjoying your downtime. There will still be plenty of the summer left to experience once the tournament wraps up. Plus, Fargo has some cool stuff you might enjoy, too. As we talked about earlier, the folkstyle season deserves to be acknowledged once it is over. Take stock of how it went, decompress if necessary, and move on. If you have the goal of competing for a national championship, the proceeding months require an enthusiastic commitment. 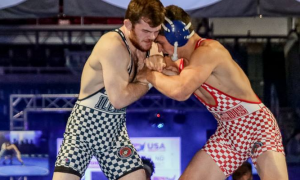 Since in the United States Greco Roman and freestyle wrestling are most often practiced during the spring and summer, many wrestlers approach this as another season. This is appropriate; after all, there are enough competitive opportunities to deem it as such. Between club practices, local tournaments, qualifiers and Fargo itself, calling it another “season” certainly sounds correct. However, each season has its own ebbs and flows. In scholastic wrestling, these are easy to see. You have your preseason tourneys and duels, state sectionals, and then the “postseason” – districts, regionals, and states. Depending on which state you live in, it can be a little cloudy when it comes to summer wrestling. Not all states have the same amount of tournaments, duels, and competitors for freestyle/Greco Roman wrestling. Local tournaments can be tough to find. Qualifying can be extraordinarily difficult in one place and much easier in another. There isn’t a lot of uniformity (which is actually one of the problems facing this country’s wrestling program as a whole). You have to work with whichever set of circumstances your wrestling opportunities demand. And that is exactly why it pays to see the Fargo nationals as its own separate season. Whether you get a couple dozen matches in before July hits or only manage a fraction of that, the goal does not change and by extension, neither does the preparation. It doesn’t matter if you live in a state where there is a dearth of tournaments and coordinated practices or if you have a wealth of coaching and matches to look forward to. If showing up to Fargo and taking home a medal is your objective, then beginning the training process as soon as you’re ready is imperative. Use whatever resources are available and try to recruit other wrestlers who may not have tried freestyle or Greco before. This is an event that only comes along once a year. Take advantage of it. Apply your desire and dedicate your training to the cause. You can get started today.